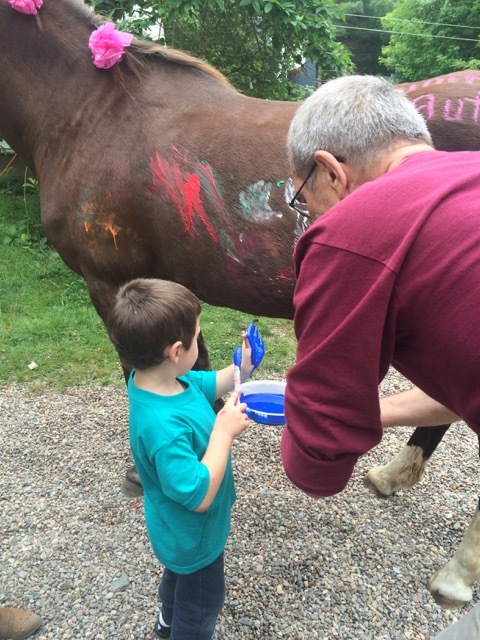 Hinchinbrook Farm is always looking for new volunteers who like to work with children, with horses or both! 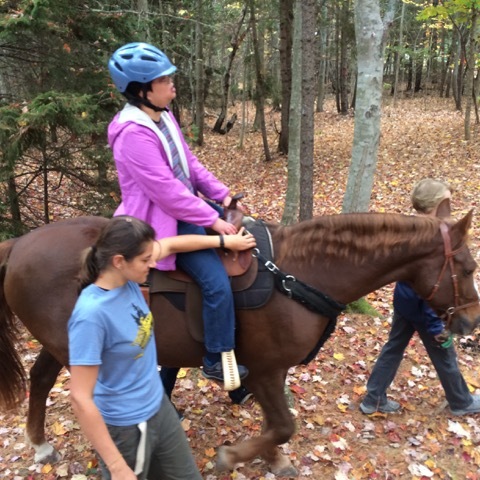 We also have some places for people who would like to work on therapeutic riding skills with adults who have mental or physical challenges. Here are some of the current 44 volunteers who call us their Tribe. Cathy Agnew is semi-retired from the health care sector. She worked for 25 years with South Shore Regional Hospital and now works part-time with Cardiovascular Health Nova Scotia. She rode as a child at the Fredericton Pony Club and her love of horses never left. 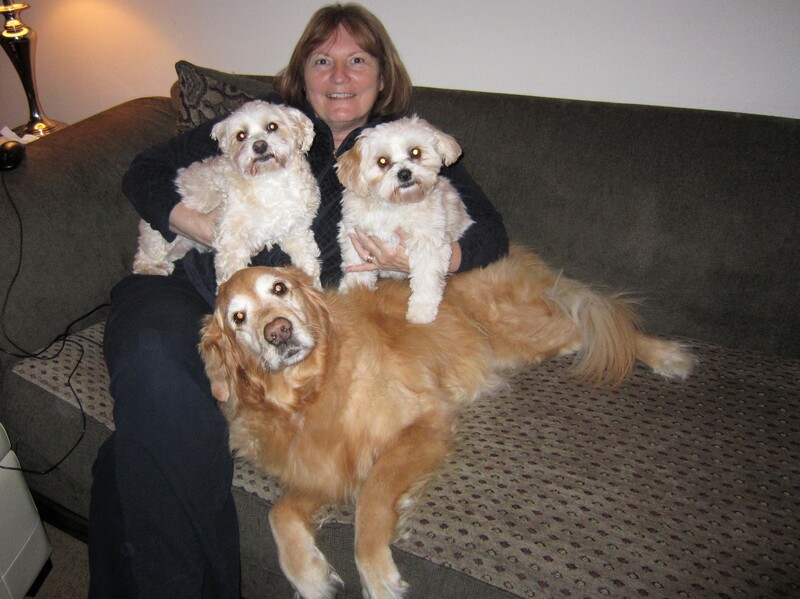 Cathy is a volunteer with the St. John Ambulance Dog Therapy Program, taking Molly into local nursing homes. Volunteering at Hinchinbrook is a natural fit and she looks forward to many years at the farm! Nikki (Nicole) Ali is a PhD student in Clinical Psychology at Dalhousie University. Se already has degrees in Sociology, Applied Psychology a nd Elementary Education. After completing her PhD she would like to use her education and experiences to work as an autism specialist. Her current research involves the study of sleep issues and neurodevelopmental disorders. Her interest in the world of autism started with working with a girl with autism about five years ago and since then she has been seizing every opportunity to work with other wonderful children on the spectrum. In summer 2013, Nikki went to New Trails in Texas to train with Rupert Isaacson learning the Horse Boy Method™. Nikki is on the Board of the Society. Elizabeth Bhagan has been a rider since early 2015 and became a volunteer in 2017. Her main mount is Dandy and she can now train others how to lunge and groom the horses. Mary Bhagan is a mom and pharmacist/owner at Kinley Drug Co. Ltd in Lunenburg. She sponsored Hinchinbrook Farm long before she came onto the Board of Directors from 2016 to 2017. Although less involved, Mary is pleased to help out when needed and at special events. 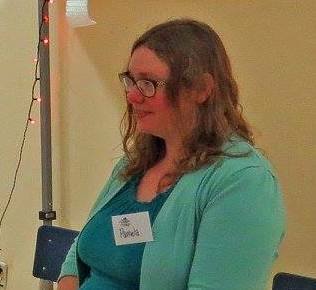 Brianne Boudreau has been a regular volunteer since early 2016. She helps with lessons, is a regular at the Horse Boy play dates and will do any of the chores that pile up quickly with 12 critters at the farm. Brianne is a student at Parkview and a favorite mentor to all the horse boy families. Extra bonus: She rides like a dream! Lucrecia Castillo hails from Ontario but has travelled the world and settled in Blockhouse. Lucrecia came to the farm in 2014 to critter sit and stayed to volunteer for a couple of months. We were very happy when Lucrecia returned to the area and immediately signed up to volunteer again. 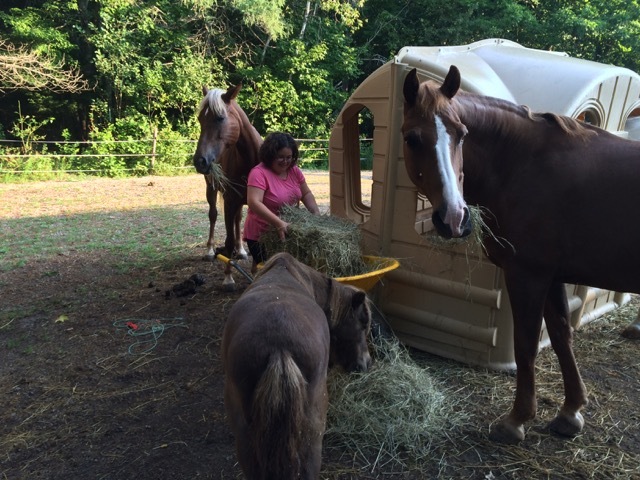 Lucrecia helps on Wednesdays and makes delicious nutritious snacks for the Horse Boy play dates. Lucrecia has another life as a permaculture enthusiast. She sets up the Farmer’s Markets and loans her expertise and energies to tree lot farmers. Stephanie Chipman is a mom with two awesome daughters and who works hard for the Bridgewater Elementary school; but since 2016 Stephanie has found Tuesday mornings to help riders and to do chores at the Farm as well as helping at some playdates. Stephanie signs up to help out at special events too and is a great resource for parents when she shares her insights and solutions. Stephanie owns “Quietude Polly” whois sister to our Delilah. Stephanie is a member of “Bluenosers Who Care”, a local group that provided funding of the 2017 summer camp. Carolyn Collicutt, the President of the Hinchinbrook Farm Society, is a mom who has served on the Board since 2011. She came to HF in 2008 through First Steps Intervention and is a founding member of the Society (in 2010). She has created a resource list for special needs families and arranges special visits by local resources such as the RCMP, Search and Rescue Canine and EHS ambulances at play dates. Carolyn is also a leader with the local Sea Cadets and the Scouts. Jaime Collicutt started at Hinchinbrook Farm as a rider when she was just eight years old, and we were just starting up. At 16 Jaime still rides but also volunteers at Horse Boy Play Dates and events. Jaime is in grade 10 at Parkview and has been a sea cadet for several years. Her organizing skills are very welcome in a tack room that gets tossed after just one lesson! Gordon Cook has finished serving our country in the most prestigious form, and now he enjoys calling Nova Scotia his home. 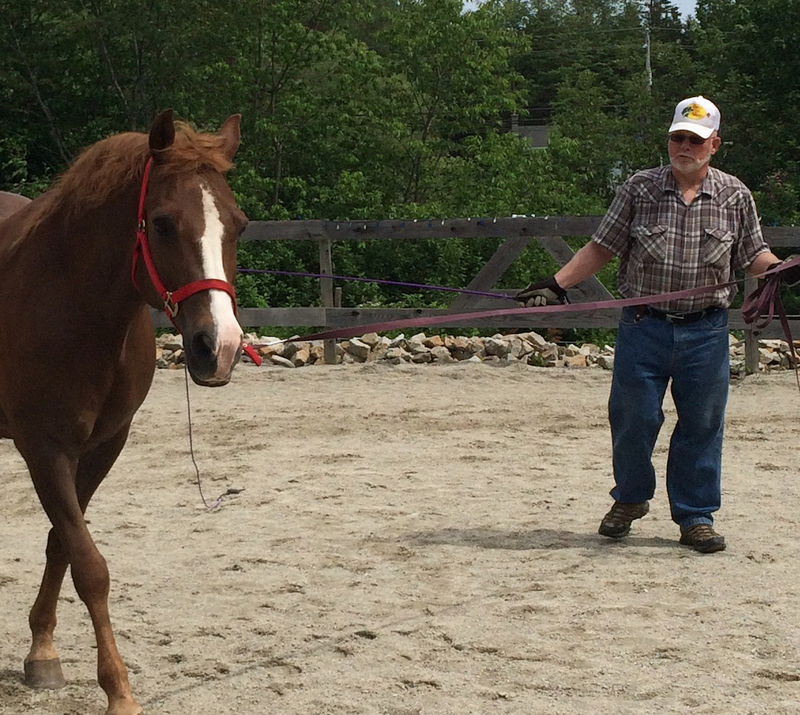 Gordon has prior experiences of mucking doots, grooming and lunging horses in his past, however, now he finds himself learning the ropes of therapeutic horseback riding as well. Gordon enjoys Dandy’s grumpy moods and the stubbornness both he and Jazzmin hold while he lunges them. Gordon promptly fixes fences and gates, leads the horses during therapeutic lessons and enjoys sneaking Dandy onto the front lawn where he can enjoy some grass – only without equipment and during their leisure time though! 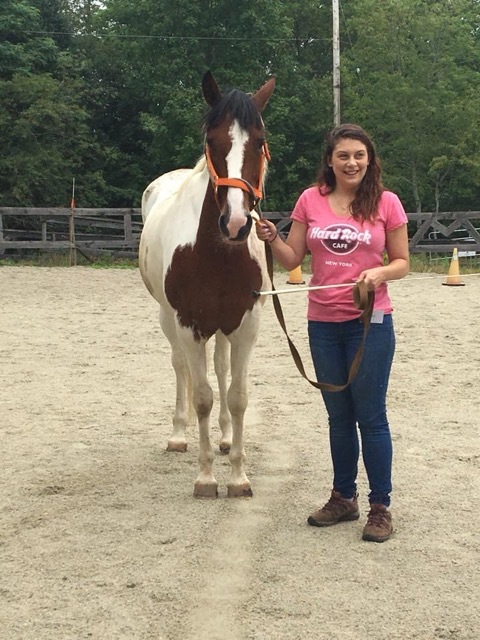 Megan Daniels is a new mom and an aspiring therapeutic riding instructor and has been volunteering with Hinchinbrook Farm since 2014. Megan has travelled to Horse Boy Central in Elgin Texas. She was raised around and with horses and still competes while working as a care assistant. 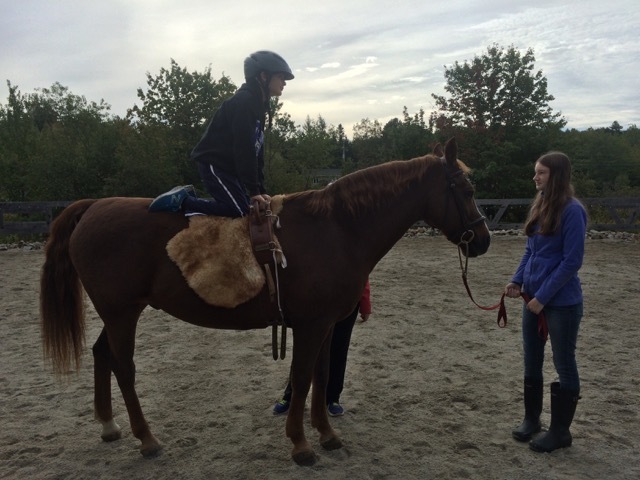 Megan’s goal is to work in therapeutic riding. She is an amazing asset to all the volunteers. She is always ready to share her horse knowledge. Peter de Vries lends his time and energy both on the Board of Directors and at the lessons and events. Peter travels from Liverpool where he has settled in to retirement from a career in medical writing. This makes Peter a great resource for information too. Peter has taken on some poster making and event photographer work for the farm. He comes faithfully to Tuesday lessons and fills in for other volunteers when needed. He has also been known to do a few chores around the Farm. 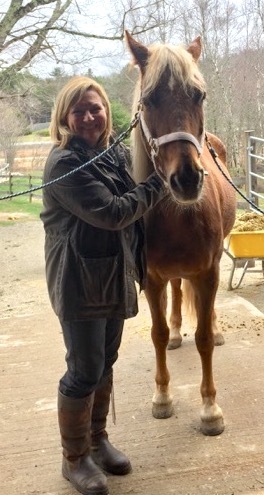 Cheryl Dyer hails from Cape Breton Island and began volunteering at the farm in 2018. Returning to Maders Cove after living overseas for many years she felt a need to help out in her community and Hinchinbrook Farm was just the right fit. A farmer at heart, she loves helping out in the barn mucking out stalls and taking care of the horses and is happy to pitch in when needed with lessons and Horse Boy play dates. David Friendly joined Hinchinbrook Farm Society as the grant writer and fund raiser in 2013. He took over as our Webmaster in April 2014. After a career in the oil industry as a safety and emergency response professional, David and his wife relocated to Lunenburg to take in the quality of life the area offered to retired people looking to stay active. David has volunteered over recent years with the Lunenburg Folk Harbour Society and the Lunenburg Doc Fest. He is a former trumpet player and currently band leader for the Mahone Bay Legion Swing Band and plays flugelhorn in the Chester Brass Band. David has been Technical Director for the South Shore Players and Producer for several productions. He also created the slide show used in the Summer Troupe production of Glimpses and produced the official DVD of the show in 2017. In addition to our web site, David manages the sites for the Mahone Bay Legion Swing Band and The Bluenose Opera House Syndicated Radio Show. A former hobby was leading groups to Ecuador and the Galápagos Islands. It had a brief re-emergence in 2012 when he took a group of 15, mostly from Lunenburg County, on their ‘trip of a lifetime’ for their own private tour of Ecuador and chartered yacht excursion in the Galápagos. 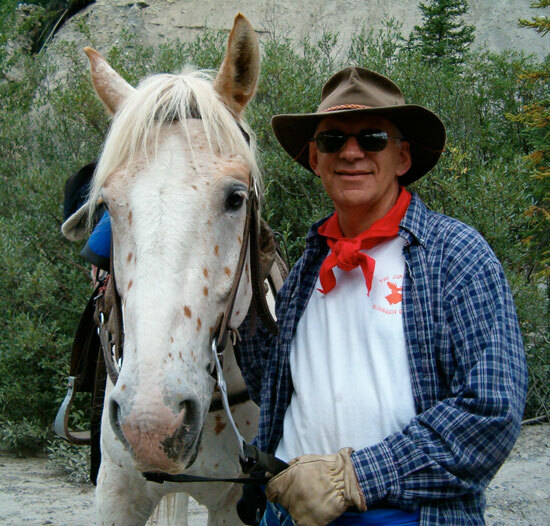 While living in Calgary, David made a point of taking a 3-day horse trip into the Rockies at least once a year. He likes the fact that, at Hinchinbrook, he will be able to keep a link with these gentle creatures. 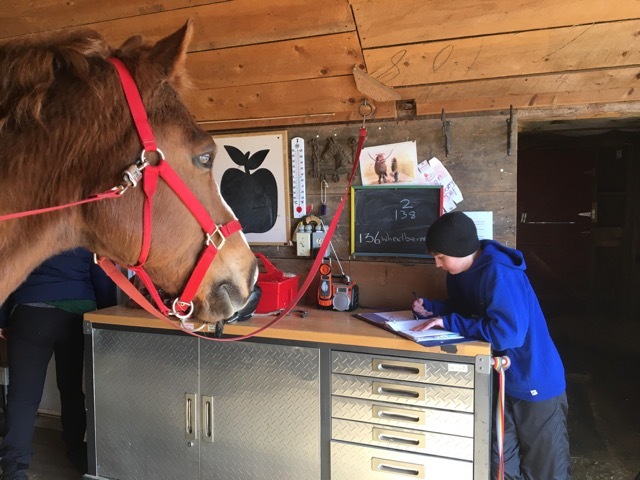 Sebastian Haumering began volunteering at Hinchinbrook Farm as a Grade 9 student at Bluenose Academy in September 2017. He will be completing his high school education at Parkview Education Centre in Bridgewater. 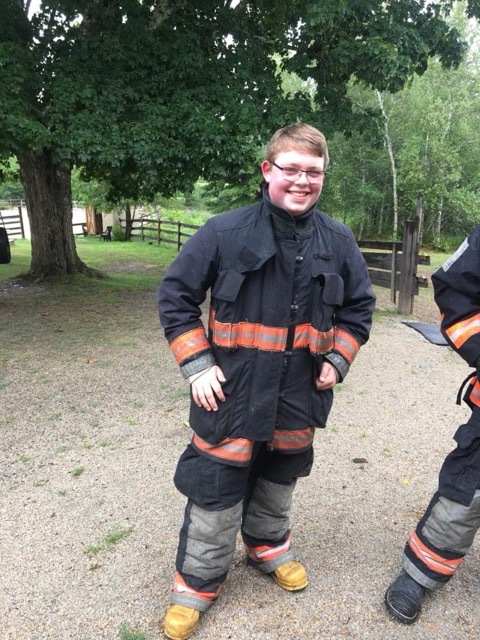 Sebastian is a skier, mountain biker and junior firefighter with the Lunenburg Fire Department. He is planning on becoming a paramedic and work for life-flight air ambulance. Darryl Hirson is one of the horse boy moms. Darryl Has helped with some admin tasks in the past. She has been a great resource to new parents at play dates. Darryl is originally from South Africa (we love her accent). She works with special needs adults and is a Teacher’s Assistant. 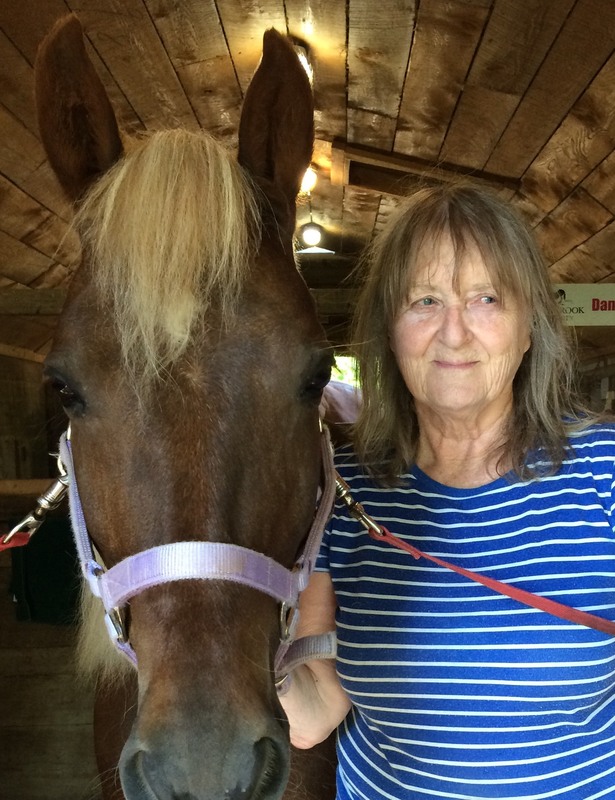 Marilyn Jones is an enthusiastic student of all things to do with horses as she is drawn to Hinchinbrook farm due to her interest in the help that therapeutic riding lessons provide for special needs families. Marilyn has kept her lifelong love of horses a secret, regardless that one prior personality test revealed that she should become a farmer. Although Marilyn does not always love the goats, Rosie and Sissy, Dandy holds a special place in her heart and Delilah’s beauty will never cease to inspire her to continue to explore her love for these beautiful 1200-pound friends. Kéla Laroque joined the Board of Directors in 2018 and immediately volunteered to take over as Treasurer. Kéla was a volunteer from 2013-2015 then took time away to study and get her MPT at Dalhousie U. Now she is a very busy Physical Therapist in Bridgewater. Kéla helps with horses, children and activities at Horse Boy Playdates and at special events. She is also known by the tribe for her homemade baking. 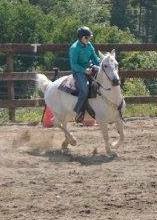 Kéla is a life long equestrian and hopes to start training in Hippotherapy. 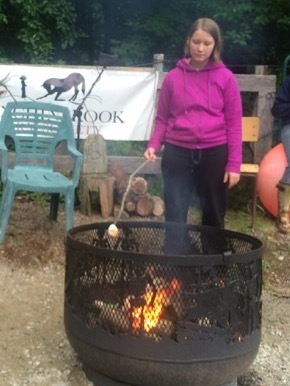 Keara Leary goes to Hebbville Academy is a member of the Hill N Dale 4H Club. She volunteers at lessons and Horse Boy. She is an extraordinary fiddler and plays whenever she can. Keara has brought her rabbits to visit the farm and to the Silent Santa. 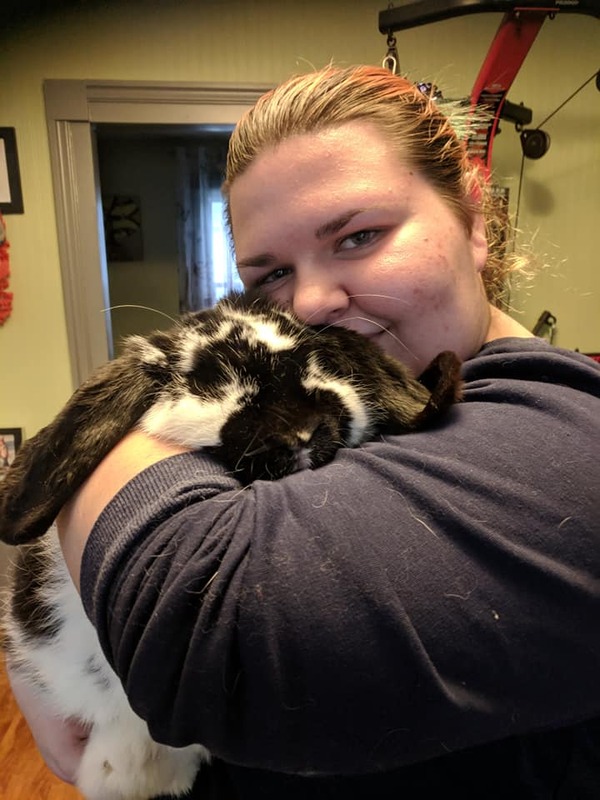 Her bunnies are super therapy critters too. Claudia Loferer volunteers on Friday mornings to give massages to the horses. For her services check out her Face Book Page. Claudia and her husband Josef came from Germany and have a beautiful farm in New Germany. As a Certified Equine Massage Therapist, Claudia is working towards optimum function and movement of the horses soft tissues. She makes the horses better for all of us. 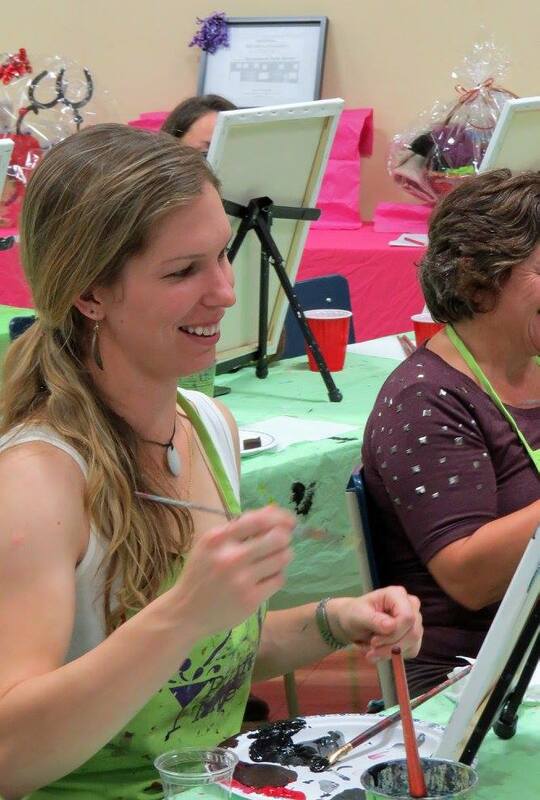 Leah Masek comes to volunteer every August now from the United States. Leah wants to learn as much as she can about horses, so she both rides and volunteers at Play Dates and lessons and helps with horse care. 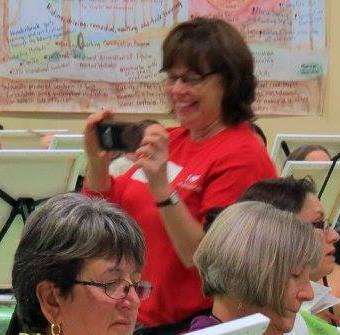 Leah attended the TTEAM leading workshop with Olga Comeau. Leah will return to the USA come September but is putting in long hours and several days a week at the farm this August. Sarah McCarthy is a psychology student at St. Mary’s University with the hopes of becoming a clinical social worker. Her mother Kathryn told Sarah about Hinchinbrook Farm, and she has been a steady volunteer throughout the 2018 summer. Sarah was certified at the Movement Course 1 & 2 in July. 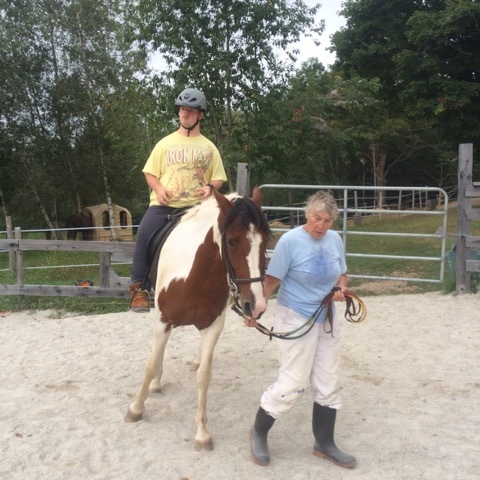 Sarah is a budding horsewoman and picking up routines because she has volunteered 3 full days a week all summer long. She will continue learning about the Horse Boy Method throughout her formal education with the dream of incorporating the two and becoming an Equine-Assisted Therapist. 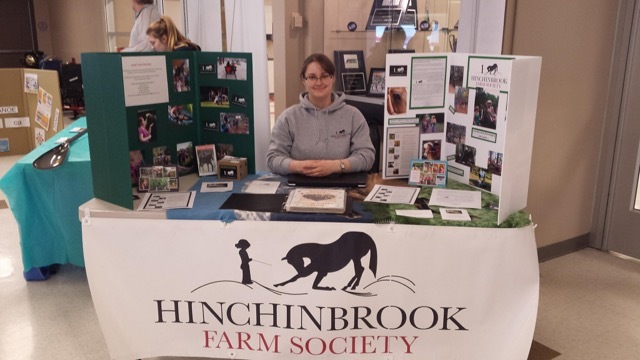 Kathryn McMillan has been volunteering at Hinchinbrook Farm since the summer of 2014. She brings her life experiences as an equestrian and grand mother. 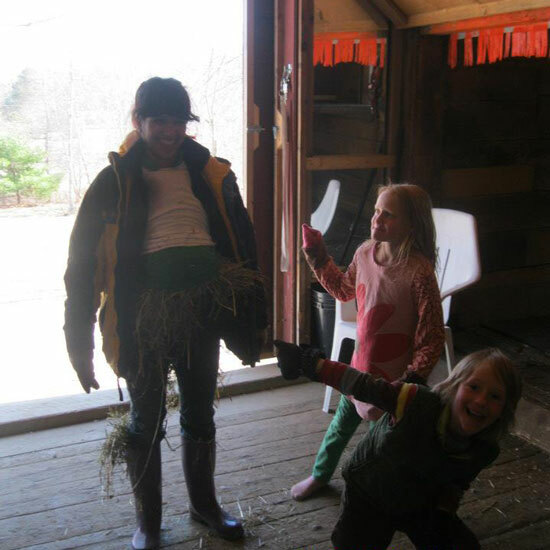 Kathryn comes early to groom and lunge the horses then helps with the kids and critters every week. Kathryn came during the BIG snow winter of 2015 hauling water and walking horses in the corridors of snow for exercise when the ring was shut down for 3 months. 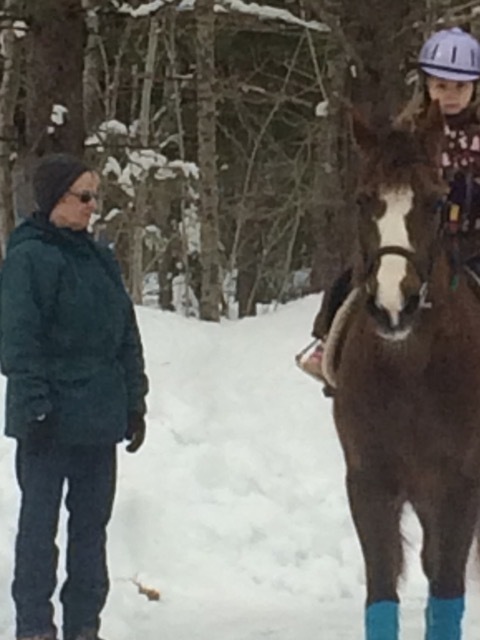 She knows the equipment, the kids and the horses making every lesson safe and open for adventure. Bruce Parks joined the Board of Directors in 2018. 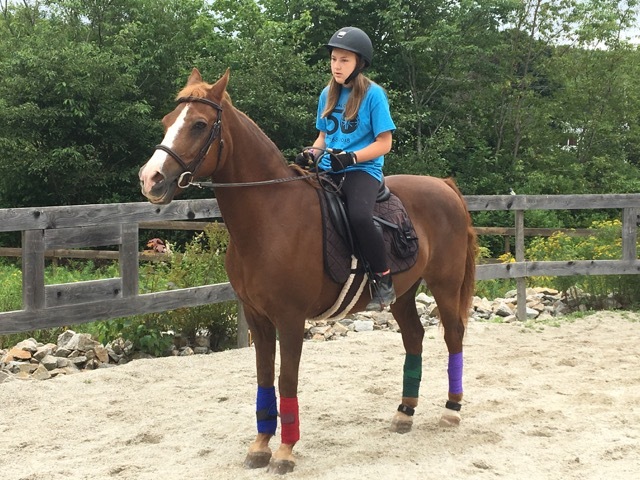 He lives in Lunenburg with his wife Jennifer and son Hunter, who has has been attending therapeutic riding at Hinchinbrook Farm since 2015. Bruce works full-time as a Paramedic with Emergency Health Services Nova Scotia and is also a fire inspector and assistant emergency coordinator for the Town of Lunenburg. Hunter Parks: Hi my name is Hunter, I am a student at Bluenose Academy and enjoy dance, music and volunteering. I started riding at Hinchinbrook in 2015 and started volunteering in 2018. I am looking forward to doing more volunteering at HFS! Carol Rolfe-Higney is a mother to 2 boys, one grandson and 1 stepson. In June 2018 she will be retiring from 36 years of nursing. She and husband Mark will be moving into their cottage on Indian Lake. Her goal then will be to find that healthy balance between volunteering and caring for herself, her family and her aging parents. Working with youth and being around animals have always been a major part of her life. She is grateful to have the opportunity to provide support at the farm and to receive so much back from the gifts that children and animals often provide. 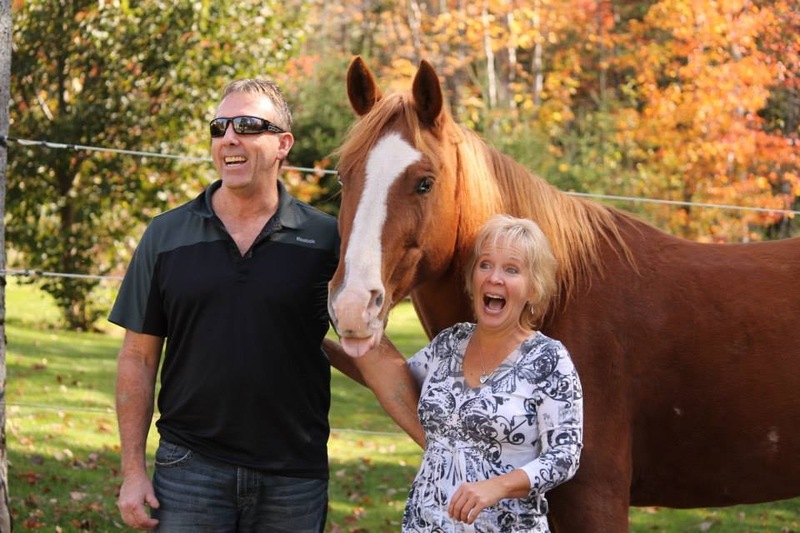 This picture captured one of her happy moments with Mark and her late horse, Babe. Dorothea Schmidt is a professional massage therapist. She started coming to Horse Boy playdates this spring offering massages to the parents. Dorothea shares the belief that supporting families and parents is the best for the community and so she beings her massage table a few playdates a month. Children who wanted a massage also have been treated. Dorothea has become the parents’ ‘go to’ person for fixing their aches. Dorothea is a special treasure to come and volunteer at the rowdy playdates, fostering mindful peaceful transformations through her magic massages to anyone who wants one. 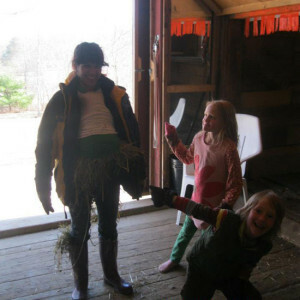 Lauren Shapiro was a very young volunteer from when she first came to Hinchinbrook Farm with her brother in August 2007 and every August since. She lives in Connecticut. 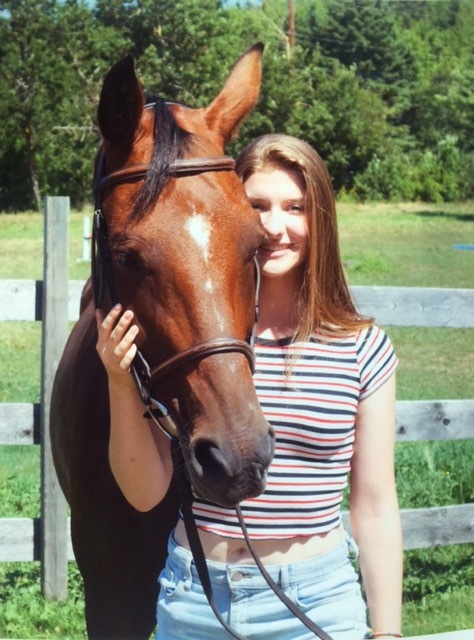 Lauren is a natural equestrian and kept “horsing around” in the States, building her abilities with horses to an unofficial grand prix level in 2014 at 14 years of age. Lauren has a younger brother with ASD and wants to use horses and nature in therapy for kids in her future career plans. She traveled to Horse Boy Texas to train with Rupert Isaacson and volunteer at their Horse Boy Camp in 2014. She is everywhere for every child all the time when volunteering at the Farm. Cicely Smith is a student at Dalhousie University, majoring in sociology and social anthropology with a double minor in law and society and psychology. Cicely wishes to join the school of Social Work in 2018. Cicely began volunteering in the spring of 2016 and found herself with Canadian Summer Student job grants both the summer of 2016 and 2017. Cicely learns new facts and creates memories with the horses of Hinchinbrook as often as possible. Cicely thinks that the goats, Rosie and Sissy, are enough fun and stubbornness for a lifetime. Although bonding with horses comes relatively new, she finds herself attached to the mysteriousness that links her and Delilah, and to the softness that holds her to eating lunch with Silverbell in her stall. Amy Sparks (our vet at South Shore Veterinary Services) came on the Board of Directors in 2014 and is now the Secretary of the Board. As Secretary she keeps the minutes, schedules the meetings, deals with NS Joint Stocks submissions and is a resource for all the activities the farm takes on. Amy holds informational workshops for the volunteers and friends of the farm about caring for horses and dogs. She often brings her agility dogs to visit the kids. Amy also helps with the training regime at the farm and keeps our friends at the Vet Clinic up to date and involved in the farm’s fund raising activities. Amanda Teal’s day job is in an office but she is also a hard working volunteer for Syrian refugee families. Inspired by her daughter, Evelyn, Amanda joined the tribe at Hinchinbrook. She feeds her newly discovered passion for horses, and learns as much as she can, at Hinchinbrook Farm. Amanda looks after the horses and helps monitor children at Horse Boy Play Dates. In July Amanda certified in the Movement Method course 1 & 2. Bonus: Amanda occasionally brings her family to operate the chipper for trail maintenance. Katie Watson is a student at Bayview and her favorite subject in school is Math. She started volunteering in 2017 after school and now is a big help for both afternoon lessons and during Horse Boy Play dates. 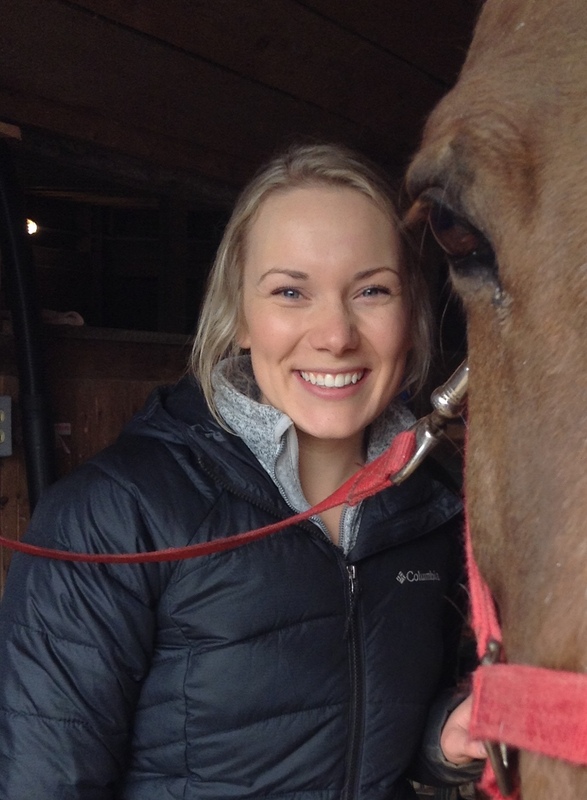 Katie took riding lessons from Jann Kreiberg at Hinchinbrook Farm for two years. She knows all the horses she is one of the original Pony Club Members from 2009. She enjoys riding horses during her spare time at the farm. When Katie is not at the farm she plays hockey and volleyball across the province and leases a horse and takes lessons at Windfall Farm. 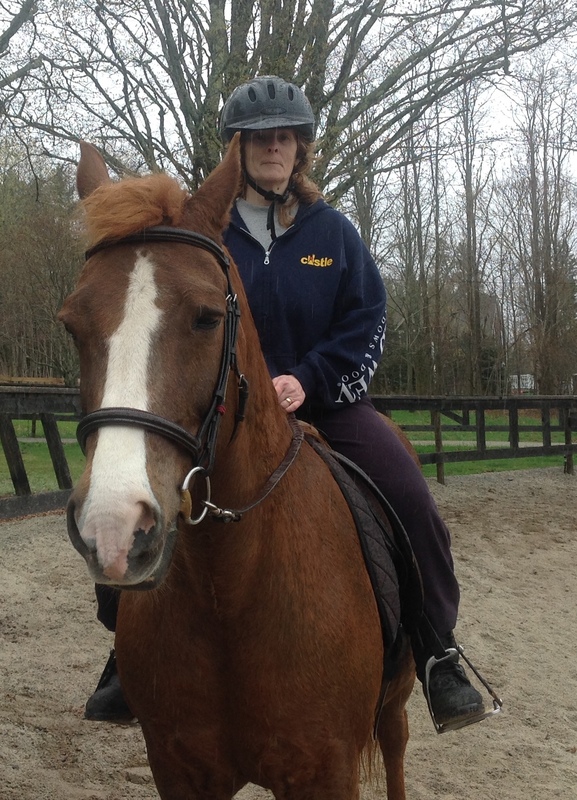 Pam Wentzell-McDormand started coming to Horse Boy and bringing her kids for lessons in 2012. Pam is a great cake and pastry maker, bringing special treats to birthdays and events. She joined the Board of Directors as Vice President in 2016 and helps with special events. Pam is a Waldorf and homeschooling mom. Her daughter Roze has been riding at the farm since 2012. Gillian Wu volunteers Thursdays, May through October while staying at her Liverpool home. She winters at her other home in Toronto. Gillian is a retired dean and researcher, and is a wealth of information (so every one asks Gil). Coming since mid 2015 to the farm she takes care of the horses and facility, helps riders, works at special events and at group visits. 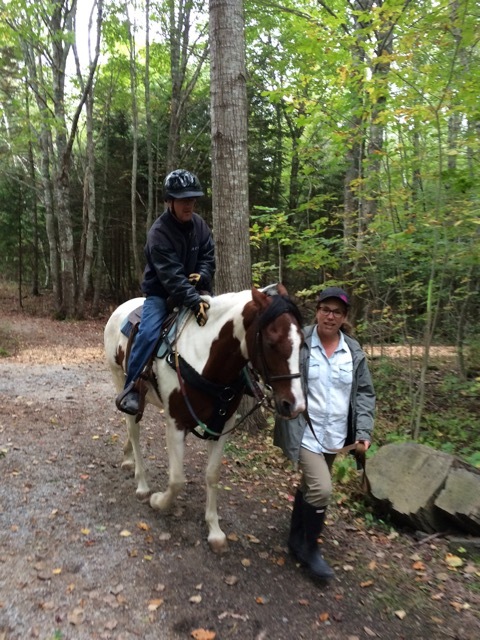 Before coming to Hinchinbrook Farm, Gillian was not a horse person but she is quickly chalking up experience.